On Wisconsin! The cheeseheads have a plethora of great value options for golfers across the state. The state has some great rolling land that allows for dramatic golf. Like Illinois, common themes are tree overgrowth, poor mowing lines and shrunken greens. This is not a final list. Over time, courses will be added and removed depending on research and experience. This is meant to be a guide to help golfers find affordable and architecturally interesting golf courses that might be overlooked and underappreciated. Lawsonia Links might be the best course in the United States that offers a regular rate under $100. The Links Course was designed by Langford & Moreau and is one of the best-kept designs of the Chicago-based architects. Known for their audacious contours and perched green sites, Lawsonia is a shining example of the pair’s design traits. This is a golf course that inspires you to play more golf and one that every golfer in the Midwest should visit sooner than later. Full article on Lawsonia. "No architecture resume is complete without having seen Lawsonia." The Woodlands Course isn't the Links, but it’s an enjoyable place to play golf. A friend of mine put it best when he said that if he was given ten rounds, he'd split them 8-2 between the two courses, but that's more a representation of the Links’ greatness. The Woodlands is a fine course, but I would only play it if you are spending multiple days at Lawsonia. The nine-hole course is on its fifth generation of family ownership! The original course was built in 1893 before being redesigned in 1921 by former Chicago Cubs pitcher and manager A.G. Spaulding. That course stands today and embodies the term “good bones”. The green complexes are phenomenal, and the volcano 2nd hole is one of the most jaw-dropping holes in the midwest. For $13 to walk 9 and $20 for 18, it’s a must-see, even if only for a couple of holes. The architecture pair of William Langford and Theodore Moreau is perhaps the most underappreciated of Golden Age architects. Their bold contouring, inspired by Seth Raynor's work at Chicago Golf and Shoreacres, became misunderstood during the dark era, leaving few untouched designs. Spring Valley is just that, a pure Langford & Moreau experience that has all the makings of a great course despite overgrown trees, greens and fairways. If you can see past its scruffy appearance, it’s a great experience. The brand new 17-hole par-3 course at Sand Valley might have the best set of green complexes of any golf course in the entire state. It's a course that’s fun and makes you want to play it over and over again. On my recent visit to Sand Valley for the Sandbox opening, I played it five times, each time using a different club. The Sandbox is pure fun. Full writeup on the Sandbox. Close to Sand Valley, the Larry Packard design accepts public play everyday. Bull’s Eye is a different type of test than its acclaimed neighbors, precise play through narrow corridors. The Packard design sits on a nice piece of ground and features some interesting holes, including a double dogleg par 5, a hole he used at nearly every one of his designs. Originally designed in 1929 by George Hanson, Brown Deer Golf Course was a charming place to play golf. The course stood as the longtime home to the PGA Tour's Greater Milwaukee Open. 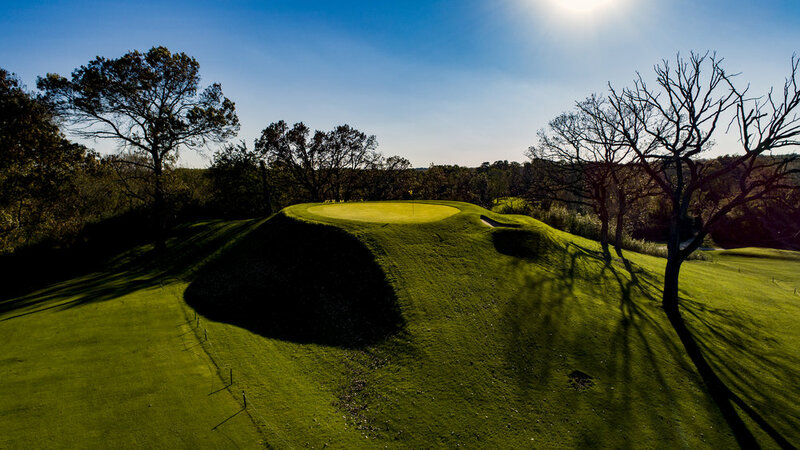 Brown Deer was one of the country's finest municipal golf courses but lost its way with extensive tree planting in the 1950s and an early 90's redesign from Andy North and Roger Packard. The redesign focused on modernizing Brown Deer for the aerial nature of the PGA Tour. These changes cost Brown Deer in the playability and charm department. The course still remains a great public option and a great restoration candidate now that the course's dreams of PGA Tour golf are long gone. Neighboring Green Bay, Brown County is a great option for golf during a trip to a Packers game. The 1958 Larry Packard design features a nice variety of holes and allows for low running shots into most. Shortly after the 1958 opening, the course added some ponds and trees that take away from its playability and width. Also, as with most municipal courses, the greens have shrunk. A simple course cleanup would do a lot of good, with tree removal and green and fairway expansion at the top of the list. CCE remains almost untouched from its original Tom Bendelow design. The 9-holer sits on incredible rolling ground and has some neat green complexes that make it worth your while when in the Lake Geneva area. I found this golf course just wandering around Google Earth, and it stuck out. Trusted advisors have confirmed that Nemadji is an absolute gem. The golf course was built in 1932 by Scottish greenskeeper Stanley Pelcher and remains almost entirely intact (17/18 holes remain). The golf course is set on a nice piece of ground, which is used as a defense and features well-thought-out bunkering. Peninsula State Park overlooks a beautiful bay outside Ephraim, Wisconsin. This isn't so much architecturally significant as it is fun. Perhaps no hole better captures that than the 66-yard par 8th hole, which is hit off a mat from the top of a cliff. Some gripe, but it's unique, and there's room in your golf life for at least one hole like it. Peninsula's most interesting holes are on the back nine. The views from the 10th green and 11th tee box are as good as any in Wisconsin, for a tenth of the price of Whistling Straits. The State Park System has shown a lot of foresight and should be commended for opening a six-hole par 3 course across the street. It's a great family facility. Not every hole is superb. I have some complaints about the front-nine, and widening the course would make several holes more playable. Play it for fun anyway. Getting a tee time during the summer can be somewhat difficult, so plan ahead. Larry Packard was one of Wisconsin's most prolific architects, and Naga-Waukee War Memorial is one of his best designs. The Milwaukee suburb's finest municipal design is crowded almost everyday of the week and offers a fun, playable and affordable option for golf. The course is set on a tremendous rolling property, and Packard uses the angular orientation of his greens well to defend the golf course. In the far reaches of northern Wisconsin, Apostle Highlands offers 13 holes with breathtaking views of Lake Superior. The course has wide fairways and a nice piece of rolling land. The design is a bit basic but the views are better than Whistling Straits. While checking out Apostle Highlands, I stumbled onto Madeline Island GC, a Robert Trent Jones Sr. design. I was enthralled by the course’s unique routing, which features 7 double greens on the 18 holes. It has to be one of the most unique and innovative routings in American golf. Upon further research and some help from Tommy Naccarato, I found that it was a similar concept to RTJ's design of Beverly Hills CC, which never got built. The land has nice movement to it and generous fairways. Madeline Island and Apostle Highlands make for a nice 36 holes of affordable golf. Shoutout to Kelly Kretz for uncovering this gem. Designed by Joe Roseman a Chicago-based lawnmower and golf course architect in the late 1920s and 30's, Maxwellton Braes remains almost untouched from its original design. Roseman learned much of his architecture craft working construction on a few Langford & Moreau projects, and it shows through the bold features and great green complexes that still exist today. Maxwellton Braes has yet to adopt an irrigation system, so the golf course regularly plays firm and fast. For a quick, enjoyable and fun round in the Door County area, Maxwellton Braes is a must see. For a fraction of the price, Big Fish offers as good if not better architecture than the high-profile Pete Dye designs in the Kohler area. While Big Fish can be a tough walk, its worth seeing when in the area. Sentryworld Golf Course is just over $100 during peak rates and worth checking out. The recent Jay Blasi redesign has breathed new life into the original RTJ design. Have a course that should have made the list? Submit it here.